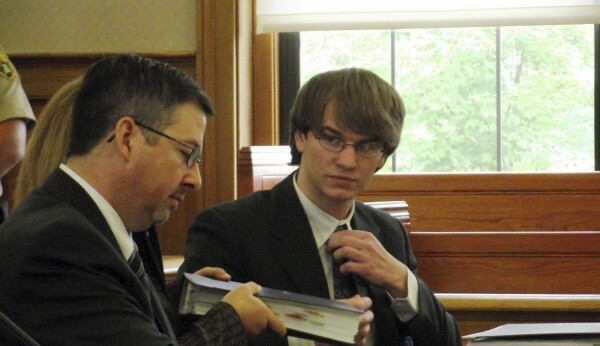 Thayne Ormsby talks to his attorneys during a hearing in Houlton in June. HOULTON, Maine — Final jury selection in the triple-murder trial of Thayne Ormsby will be held Monday morning in Aroostook County Superior Court. Once 12 jurors and three alternates are seated, oral arguments will be presented, Superior Court Justice E. Allen Hunter said late Friday. The judge made the announcement at the conclusion of three days spent slowly winnowing the pool of potential jurors from 118 to 33 deemed impartial and able to serve. Also late Friday, Hunter denied a defense motion to move the trial out of Aroostook County because of pretrial publicity. Ormsby, 21, an Ellsworth native who was living in Orient in 2010, is accused of killing two men and a 10-year-old boy in the tiny town of Amity and setting a truck on fire to destroy evidence. He was arrested in New Hampshire after fleeing Maine. Deputy Attorney General William Stokes, who is prosecuting the case, said before the noon lunch break that there needed to be at least 36 or 37 people from which 12 jurors and two or three alternates could be chosen. The prosecution and the defense team usually each have 10 preemptive strikes they may use to remove jurors from the pool and one each for the alternates. Late Friday, however, Stokes agreed to give up some of his preemptive challenges, Hunter announced. Opening arguments originally were scheduled to begin Friday morning. The trial is scheduled to conclude April 20. Stokes declined to comment on his decision or other aspects of the case. It is the practice of the Maine attorney general’s office not to comment on cases until a verdict has been announced. Defense attorneys James Dunleavy and Sarah LeClaire of Presque Isle did not express dissatisfaction with Hunter’s decision. “We’ve gone through the process and the process worked the way it was designed to work, and we will proceed,” Dunleavy said after court recessed for the day. Ormsby pleaded not guilty in July 2010 to three counts of murder and an arson charge in connection with the deaths of Jeffrey Ryan, 55, Ryan’s son Jesse, 10, and Ryan family friend Jason Dehahn, 30, all of Amity, on June 22, 2010. They were found dead about 27 hours after the killings at the Ryans’ home on U.S. Route 1, according to police. Ormsby added not guilty by reason of insanity to his not guilty plea in April 2011, LeClaire said Friday. Hunter previously ruled that Ormsby is competent to stand trial and able to assist in his defense. Because of his insanity plea, Ormsby will be tried in two phases. In the first and longer phase, the jury will be asked to find if he is guilty or not guilty of the charges on which he has been indicted. If he is found guilty, the jury will hear evidence as to his state of mind at the time of the crime. Jurors then will be asked to determine whether Ormsby was criminally responsible for his actions. If the jury finds he was insane when the crimes were committed, Ormsby would not be sent to prison but to the Riverview Psychiatric Center in Augusta for an undetermined amount of time. If jurors find him guilty and sane, Ormsby would face a sentence of between 25 years and life in prison on each of the murder charges. He would face up to 30 years in prison if convicted of arson. Judges are allowed to impose life sentences in Maine under specific circumstances. One of them is being convicted of multiple murders. More than 35 potential jurors were questioned individually Friday. All were asked about their knowledge of the trial and relationships to possible witnesses. The judge and attorneys also asked potential jurors about their experiences with the law or inherent biases that might prevent them from judging the case fairly. Some jurors were dismissed for ill health or because serving on a jury would be an economic or personal hardship. Others were excluded after they expressed doubts about their ability to be impartial. A few were removed from the final pool because they said it would be too difficult to serve on a case that included the death of a child. None of the potential jurors questioned Friday were excluded from the final jury pool because he or she knew too many details about the case. Police said the victims were stabbed to death with a combat knife that Ormsby reportedly always carried with him before he took Ryan’s pickup truck and burned it with the aid of an accomplice. State police divers have found the knife, officials said. Police said the defendant confessed to killing Jeffrey Ryan because he believed Ryan was a drug dealer. Ryan’s family has denied the claim, and a criminal background check on Jeffrey Ryan revealed no history of drug-related offenses. Ormsby’s attorneys filed paperwork seeking to suppress statements that he made to police in June and July of 2010, claiming that his Miranda rights were violated. Hunter rejected the motion in December 2011.